In stock -This product will ship today if ordered within the next 11 hours and 10 minutes. 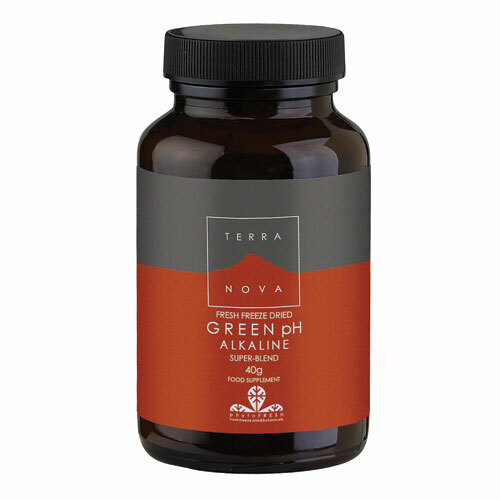 Green pH Alkaline Super-Blend 40G. An alkalinising powdered blend combining Kale, Nettle, Spinach, Parsley, Endive, Dandelion, Watercress, with Wheatgrass Juice, Broccoli Spout and Celery. After harvesting, TERRANOVA’S phytoFRESH fresh freeze-dried botanicals are cleaned, immediately flash-frozen and then freeze-dried. Unlike standard drying methods (which can degrade important compounds and alter a plant’s delicate biochemical balance), fresh freeze-drying of plants actually helps protect both potency and balance (even retaining enzyme activity). Research shows that freeze-drying offers clear advantages over other drying methods in terms of activity and preservation of original plant constituents. Freeze-dried plants are more soluble and have superior shelf stability. As a food supplement for adults, take ½ teaspoon (approx. 2.5g) per day at mealtime, mixed with juice or water. Not recommended during pregnancy or breastfeeding unless on the advice of a healthcare practitioner. If taking prescribed medication, consult a physician before using this product. Do not exceed state does unless directed by a healthcare practitioner. Below are reviews of TERRANOVA Green pH Alkaline Super-Blend - 40g by bodykind customers. If you have tried this product we'd love to hear what you think so please leave a review.